Primarily touted as a social content sharing site, Medium is one of the most popular and most visited websites in the world, ranked 348 worldwide and 272 in the US (as of this publication) according to SimilarWeb. Medium was introduced in 2012 and was founded by one of Twitter’s co-founders, Evan Williams. The influence of Twitter becomes more obvious once you sign up and connect, as your Twitter followers who are also on Medium will automatically be following you here making it easy to quickly build a following. Medium started as invite-only but later grew to the point where anyone can now sign up for an account. If there’s one thing Medium did right, it was how quickly they were able to build an audience. Connecting WordPress to Medium is a great way to start syndicating and spreading your content to a wider audience, and an easy step to add to your content marketing strategy. Through plugins and republishing content from WordPress to Medium, we’ll go over how to connect the two platforms and the best strategies for syndicating your content to reach more readers. Medium also found success by recommending stories they believe their users will be interested in, based on the topics of interest they chose upon signing up. People can react to these stories and recommend them the most popular of which become featured. Peer recommendations are a powerful thing! Many publications moved to publish on Medium (or add a Medium arm to their content strategy) because there’s no advertising on the platform, which provides a cleaner user experience when it comes to consuming content. As an author, on Medium, you can easily publish long-form content without needing to build and maintain a beautiful blog design to support it. As a reader, its algorithmic timeline will give you suggestions on what to read next, based on your interests. Why Share Content on Medium? Reach new audiences. Even if you have a website and a strong social media presence, it never hurts to send more targeted traffic to your website. Medium helps you reach this targeted audience by suggesting your content to people interested in the subject matter you’re writing about. Popular topics include business (entrepreneurship, startups), culture, technology, and life learning. Real-time engagement. Much like other blogging platforms, Medium reports how many people have read your stories, including data regarding how many people have read which articles until the end. Also, people can show their appreciation for what you’ve written by reacting to your stories, giving them applause. More visibility. 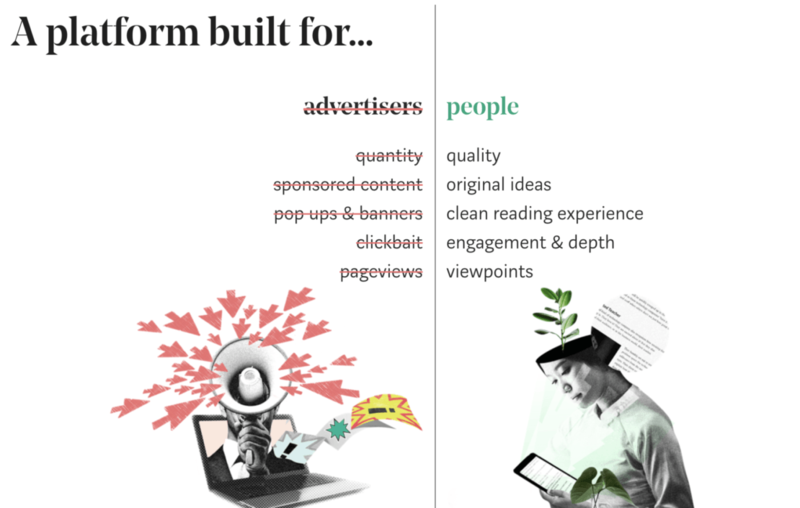 If you bring your A-game to Medium, you’ll benefit from additional visibility opportunities with the platform’s 60 million monthly readers. Top stories (as determined by views and applause) get featured prominently on the Medium homepage, email digests, and within the Medium app (available for iOS and Android). There’s no need for new content. You can simply cross-post from your website to increase the reach of the articles you’ve already written. Worried about duplicate content issues? 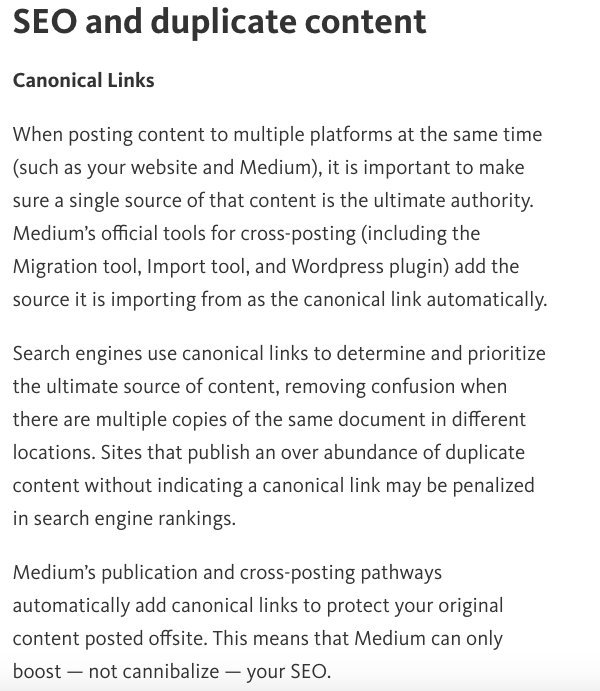 Skip ahead to the bottom of this article, where we demonstrate how cross-posting to Medium is usually not an SEO duplicate content penalty. It’s easy to cross-post from other websites. Medium offers a great import tool, which makes it easy to cross-post from other websites. The WordPress to Medium plugin allows you to republish old blog posts on Medium as well as publish new posts to Medium, directly from WordPress. It’s worth noting that the official Medium plugin hasn’t been tested with the last 3 major releases of the WordPress core. According to Github, the plugin is no longer supported or maintained by Medium. They also mention that it’s intended mostly for development purposes. Furthermore, some WordPress to Medium plugin reviews cite incompatibility with the latest versions of WordPress and limited functionality in some cases (at least one reviewer mentioned that the plugin doesn’t work with scheduled posts). For many, there won’t be any issues but it’s worth testing the WordPress to Medium plugin’s installation on a staging site before pushing to your live website. Once the WordPress to Medium plugin is installed and activated, you’ll need to connect your WordPress account to your Medium account. You can do this by going to your WordPress admin dashboard, clicking on Users, then clicking on your user profile. Scroll down to the new Medium section that now appears and look for the Integration Token field. Initially, it’s left blank, so you’ll have to grab the integration token from Medium. The integration token is a specific code generated by Medium to connect to your WordPress site (like an API). Go to Medium.com and sign up for an account if you don’t have one yet. If you’ve already signed up for a Medium account, go to your Medium Settings and scroll to the Integrated Tokens section. Enter a description for the integrated token (ex: “WordPress integration” or “WP Blog”) and click “Get Integration Token“. Don’t worry about getting too descriptive unless you’ll be connecting your Medium account to several different WordPress sites. Medium will generate an alphanumeric code, which you can now paste to the Integration Token field in your WordPress profile. Once you update your user profile on WordPress, your Medium and WordPress accounts will be synced. But there are still some settings you’ll want to play around with before your setup is officially complete. If there’s an article you’ve written in the past that you’d like to cross-post to Medium, open up the editor for that individual post. To the right on your screen, you’ll see a Medium widget. The default setting for “Cross-post as:” is “None“, meaning that when you publish something on your WordPress website, it won’t automatically publish to Medium. You can change the default cross-post status in the WordPress dashboard by going to Users > your profile and scrolling to your Medium settings. None: For when you don’t want to cross-post to Medium. Unlisted: For blog posts that are private and can only be accessed by those who have a link. Public: The best option if you want to directly publish your post to Medium. Note** This works best for text-only posts because some images, graphs, and charts don’t translate well from WordPress to Medium. Make sure to do a once-over of your WordPress to Medium post as soon as publishing occurs to fix any potential cross-posting errors. Draft: This option transfers your WordPress-published post to Medium as a draft. This is the ideal cross-posting option if you want to change the layout of your post before publishing to Medium, as WordPress and Medium have different layout/formatting options. To publish an old WordPress post to Medium, click the Edit option and change “None” to “Public“. Before leaving the post editing window, click “Update” to save the changes to your post. If relevant, update your old post before cross-posting to Medium. Once cross-posting has been switched to Public, and the post has been successfully published to Medium, future changes to your original WordPress post won’t be reflected on Medium. Another WordPress to Medium fact worth noting? You’re limited to re-publishing up to 10 posts per day. One of the things that people like about Medium is the ease at which they can upload already-published articles to the platform to reach a greater audience. But there are a few specific concerns that people attribute to publishing content on Medium. First off, it’s worth talking about Medium’s “standards”. The Medium platform features both well-written articles and those written in more relaxed “blogging style”. As Medium curates a variety of content from a variety of contributors, not having set standards for publication is one of the criticisms Medium faces. Second, because of the relaxed standards when it comes to content, Medium can be a breeding ground for plagiarized or duplicate content, which can trigger a Google penalty. There is a chance that Google will give attribution to the content published on Medium versus the content on your original website (resulting in Google penalizing the website), but Google tries as much as possible to identify the original source first. Ryan Battles shares how he cross-posts content from his website to LinkedIn Pulse and Medium, and so far, the content from his website ranks higher than the “duplicate” content on these other platforms. Preventive measures against duplicate content include waiting at least a week before reposting content on Medium, making some minor edits, and using canonical links, which credit the original article. Medium also offers an option in the settings to change the cross-linked status. This nifty feature displays on your WordPress website that the post is also published on Medium, placing a link on your Medium account to the post that originally appeared on WordPress (further cementing the fact that your WordPress website is the original publisher). Medium’s plugin allows you to share WordPress posts on your Medium site, but not the other way around (sharing Medium posts on your website). To make this possible, the Display Medium Posts plugin makes it possible for you to display Medium posts on any part of your website, using shortcodes. It only has 1000+ installations so far but was last updated a month ago. IFTTT supports both WordPress and Medium. Sign up for an IFTTT account if you don’t have one yet and create a recipe to connect WordPress to Medium. There are some recipes for Medium, such as this one which automatically shares articles you’ve bookmarked on Medium to WordPress. The Blog2Social Plugin can also be used to re-publish articles from WordPress to Medium, as well as to other social platforms, such as LinkedIn, Twitter, Facebook, Instagram, Google+, and more. 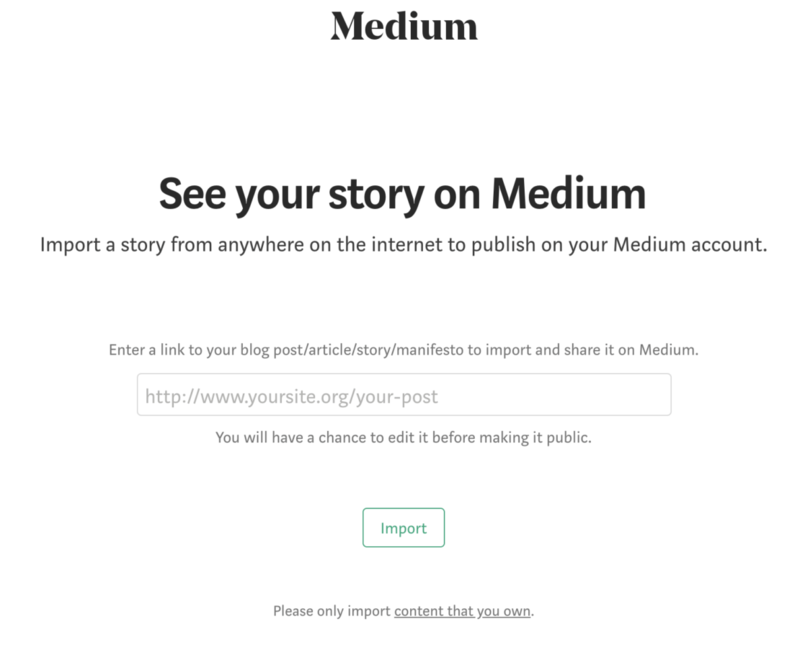 Medium has a built-in import tool that allows you to share existing posts to Medium. All you need to do is input the URL of the post you want to share and click on the ‘Import’ button. The post will then be loaded up and formatted for Medium, saved as a draft. After it is done importing, click the “See your story” to make any necessary changes. When you import content to Medium, sometimes text and image formatting changes, so check if you need to make any additional changes. While you’re at it, make sure to change the permalink, create a title and description, and add relevant tags to increase discovery. Using the Medium import tool can be more tedious than using the Medium plugin but is a better choice if you need to upload a post with several images, to ensure the Medium version of the post turns out great. The only downside of this tool is that it makes it easier for people plagiarize your content- all they have to do is enter your URL to import a post. However, Medium helps remedy this possibility by adding the post source at the bottom of each post. With over 60 million monthly readers and a wider, more discerning audience than most WordPress websites can achieve on their own, Medium can be a great platform to cross-post your blog content. Although many fear a duplicate content penalty by cross-posting content from WordPress to platforms like LinkedIn or Medium, with proper process, you’ll avoid any negative backlash by Google. Do you cross-post content from WordPress to Medium? We’d love to hear about your tips and tricks in the comments! Maddy Osman creates engaging content with SEO best practices for marketing thought leaders and agencies that have their hands full with clients and projects. Learn more about her process and experience on her website, www.The-Blogsmith.com and read her latest articles on Twitter: @MaddyOsman. Maddy Osman, thanks! And thanks for sharing your great posts every week! WordPress plugin doesn’t authorize token anymore, and there is no import story button anywhere on medium. Do you have any updates or suggestions? PamG 2 days, 8 hours ago. Adam, I just joined Medium, to compliment a pre-existing WP site. Ran into your issue, but research gave the cure. Look in the upper right (Medium) corner, where you’ll see your profile pic. Click. DropDwn menu includes Stories. Tap Stories, which presents the Import Story button.